Hello everyone! Happy Friday! I hope your weekend will be wonderful! I made this card for today's limited supply challenge on SCS, which was to only use white cs, no designer paper, only white or clear embellishments, and only one color of ink, plus limit the layers. I combined it with this week's Stampin Sisters in Christ challenge, which was to use a gift on our card. Well.... my "gift" is the sentiment. Truly this is the greatest gift of all... the gift of God's Son, which we celebrate on Dec. 25th but rejoice over all year long, because truly the gift is indescribable! When I think that the Creator of the Universe loved us so much that He sent His Son... perfect and sinless to pay the price for our sin so that we could be reconciled to Him and live in relationship with Him, and eventually spend eternity with Him in heaven, I am truly awestruck! 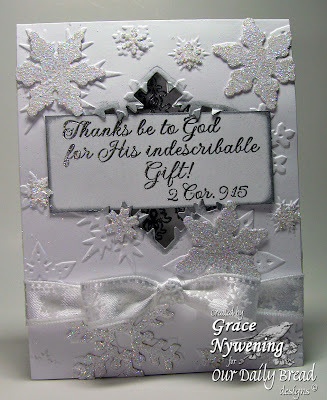 I used two Newly Released Our Daily Bread designs sets: "Peace and Joy" for the big snowflake image and "His Gift" for the sentiment. I have wanted to make a window card with this image since I saw it, so today with my limited layers was the day! I placed the largest die cut snowflake from Spellbinder's Create A Flake where I wanted my window and ran it through the Big Shot. 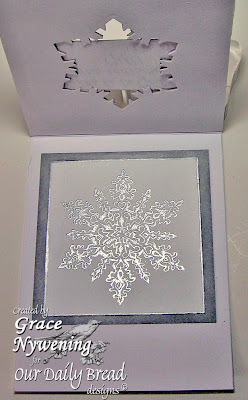 I embossed the large snowflake and centered on the inside of the card right behind and lined up with the die cut opening. When the card is closed, the stamped image actually fits well in the cut out. I embossed the sentiment and tucked it in to the snowflake cut out. It is removable as a bookmark or even a verse to put on your frig. I used many die cut snowflakes that I glittered with Dazzling Diamonds for the front, sponged the matting for the inside snowflake with Brilliance Silver and added a snowflake ribbon by Make it Christmas. On the inside I have my embossed snowflake which I edged with Silver Brilliance Ink, and then I matted that on a white square I had sponged with the same ink to give a little definition. How about that!!! I made a card that really is ONE single Layer!!! I need to mark this date! LOL! Most of you know I'm not comfortable without several layers, but this has it's own charm. Grace, this is so creative and beautiful!! I adore white on white with the sparkle!! Your skills never cease to amaze me!! Grace this is such a lovely card - I love the concept of the sentiment being removable - your art is a real blessing and inspiration. Oh Wow Grace! This is simply stunning!! Love teh snowflakes and the removable tag. Gorgeous inside and out!! Such elegance. 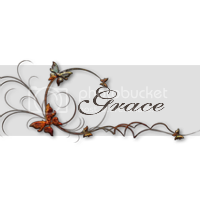 Grace it is always a pleasure to visit your blog. What a lovely card you've created, with all the white. Just lovely. You always WOW me Grace! This is gorgeous! Hi Grace, your blog is always beautiful and I really enjoy reading your write ups with your card...I agree with all you have said here, and love your card. The white is so pristine, and the inside is just as gorgeous as the outside!! Simply beautiful, Grace. I'm so glad you share your lovely cards with SSCC! Just gorgeous Grace! 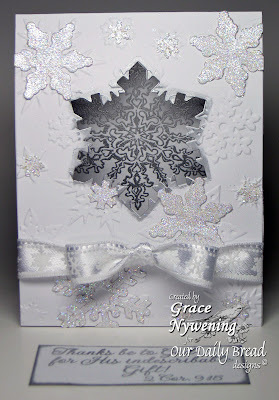 The silver and white snowflake design is so elegant and pretty! Marvelous! Beatiful card Grace. I love the way you used the snowflake image.. It is perfect for this card.. I like your snow...hehe.. Can you send some real snow. Garace,this is so beautiful. I am glad you took so many pics so I can continue feasting on this treasure. Thanks for taking the time to share your creations with us at SSCC during this busy season. Absolutely amazing -- these are really knock outs -- so much to enjoy with "limited" supplies -- and all on one layer!!!! think that should be a challenge too -- one layer -- that is so hard to do -- I always want to pop everything up and add layers too. Thanks so much for sharing your beautiful thoughts and your beautiful work. Beautiful card. Our pastor preached on this verse this week. He emphasized how even though we can't describe the gift, we don't have to to accept it. Your card is so elegant. Grace, this card is gorgeous! I love all the white and silver. You did an amazing job! That verse is one that the kids in our AWANA program learn early on, so I've heard it tons lately and I just love it! Thanks for sharing your card with us at SSCC! Wow, this is soooo gorgeous and so creative!!! Lovin' it!!! Great message in your post..so TRUE!!! LOVE the card, you have my address, right?? LOL!! Truly an awesome project! Love the colors on this one...or lack thereof! The white on white is just beautiful and elegant!